"Marathon Sail and Power Squadron"
are Registered Trademarks of United States Power Squadrons, Inc. 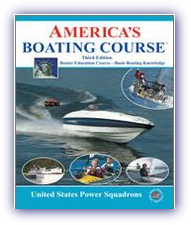 The March 2019 "America's Boating Course" course is taught to the public at the Marathon Yacht Club (MYC) at 825 33rd St Gulf, Marathon FL 33050. This course is offered to promote public awareness of the dangers on the water and to teach safe and proper skills. The Instructors are knowledgable local volunteers from the Marathon Sail and Power Squadron,and is offered with our training partner the Marathon Yacht Club. If you pay the $45 for course materials, ($30 for MYC and MSPS members) you can bring the rest of your family for free! Only the one person will receive the Book and Certificate though, unless registered and paid. Special pricing applies to MYC members. NOTE - Even though you can register and pay at the start of class, we really need your advance registration online so that we can order your book to have available. If any questions email Gregory Absten at Absten@LaserTraining.org, or call my cell at 305.849.0285. - Required equipment, navigation lights, boat registration, law enforcement and Florida regulations. - Aids to navigation, navigation rules, emergencies including use of VHF radio. - Review of homework, overall review, final exam and awarding of certificates, membership interviews. The course is open the public, 12 years or older. (younger can attend but won't receive a certicate) Successful completion of this course will qualify that person to obtain a Florida Boating Safety Education I.D. Card. You do not have to own a boat to take this course, however, if you had to handle someone else's boat in an emergency, would you know how to cope? Take the course, learn form the experts. You never know when that bit of knowledge will become useful. Registration is at 12:45 PM Saturday at the Yacht Club. MEMBERS Cost is $30 per person (cash or check) payable at registration. Payable to "Marathon Sail & Power Squadron"
Class begins promptly at 1:00 PM (right after registration) and will run until 5:00 PM. Return Sunday at 1 PM to continue, then a review, exam (60 questions) and squadron orientation. Most insurance companies will grant reductions in premiums for class completion. At the conclusion of the course, those who successfully complete the course will be issued a certificate. You do not have to own a boat to take the course. Bring the family. LEARN TO SKIPPER A BOAT WITH CONFIDENCE! .....which requires that anyone born on or after January 1, 1988 must pass an approved boating education course to operate a motor vessel of 10 or more HP within the State of Florida. One Weekend Completes Entire Course! $45 - Nonmembers - and we'll apply that to your MSPS membership if you join!